Should you get out now ... or go “all in”? 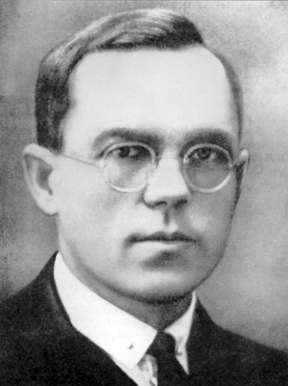 The Russian economist who predicted what’s happening in today’s stock market ... and was executed for being right! Or take their money out now and stuff it under the mattress before the next crash comes. 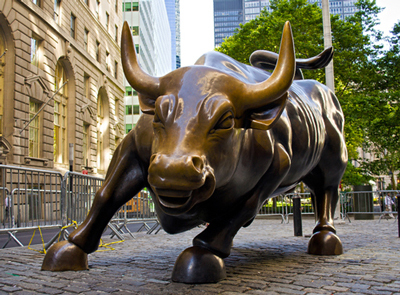 This stock market is on a bull run unlike anything we’ve seen in history. 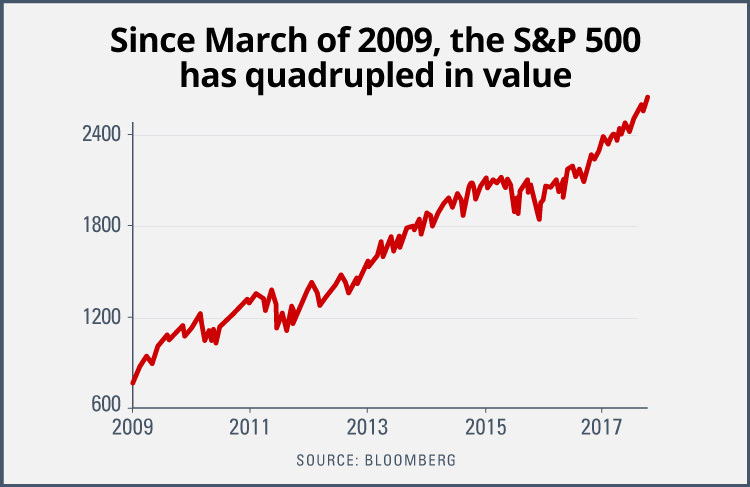 Since March of 2009, the S&P 500 has quadrupled in value. In just twelve months, the Dow Jones set over 40—count ‘em, forty! — record-breaking closing highs. At one point we saw twelve straight months with a positive return in the S&P — the first time that’s happened since 1935. So how come nobody is popping champagne corks ... eating caviar ... and buying yachts? Look around you these days and all you see is anxiety, fear, and worry. Every investor I meet nowadays is as nervous as a long-tailed cat in a roomful of rocking chairs! “What goes up must come down,” they say. Et cetera. Et cetera. Et cetera. Take it from me, none of that stuff matters. There are forces beneath the surface of this market that are far more powerful than anything you can see from watching the usual indicators. That’s why I KNOW the answer to the question of whether you should go all in or get out now. The answer is you’ve got to do BOTH. You’ve got to go “all in” right now. And get ready to get out fast later. Because the rise in the stock market we’re seeing now is the first sign of a tidal wave that’s headed our way. Over the next few months, this “stock market tsunami” is going to lift the Dow to 45,000. Yes, you read that right. You will see the Dow reach 45,000 in a matter of months. The bad news is that when this tsunami hits the shore, you’re going to see the mother of all crashes. If you want to survive, you’ve got to make as much money as you can right now. Then get out when the wave begins to crest over the top. In the next few minutes, I’m going to show you exactly how to do that. Hello, my name is Sean Brodrick. Fifteen years ago, I met a man who changed my life forever. His name was Larry Edelson. Although Larry and I were both experienced market analysts and traders, Larry had an ability to see the future unlike anyone I’ve ever met before, or since. In 1987, for example, he predicted the worst collapse in U.S. stock market history. Everyone thought he was crazy because America was enjoying one of its longest economic booms of all time. But they stopped laughing on October 19, 1987, when the Dow lost 23% of its value in a single day. Twenty years later, Larry was one of the few analysts who warned we were in a housing bubble. He said the housing crisis would take the stock market and the entire U.S. economy down with it. Of course, he turned out to be exactly right. Then in March of 2009, he said the worst was over and it was time to buy stocks again. Over the next seven years, the S&P rose by 252%. Just like he said it would. 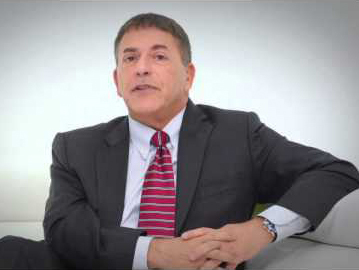 If the name Larry Edelson sounds familiar to you, it’s probably because you’ve seen him interviewed in the financial press many times. The media always asked Larry how he could see what others couldn’t. Journalists from the New York Times, CNBC, Forbes, and many others grilled him about what would happen next in the stock market. I’ll never forget his sly smile when he made bold predictions that often flew in the face of what every other market analyst was saying. Like the time he said the Dow Jones would soon cross 20,000 on its way to 45,000 by 2020. I thought the reporter would spit out his coffee when he heard Larry say that! But guess what? That’s exactly what’s happening right now. Over the course of the next few minutes, I’m going to tell you exactly what Larry said to me. Larry Edelson passed away recently. His death came as a shock to his friends, family, the global financial community, and Larry’s thousands of avid fans across the world. I lost a friend, and a great, personal mentor. But typical of Larry, he knew what was coming ahead of time and he planned ahead for it. As my professional mentor and personal friend of 15 years, Larry passed the torch to me to preserve his legacy. He founded The Edelson Institute, where I am now the senior editor. Ever since Larry was a student at Columbia University, he’d been fascinated by the cycles and patterns that occur over and over again in human economies. Investors tend to make the same mistakes over and over again. Human beings tend to make the same mistakes, misjudgments, and misunderstandings again and again. That’s an important insight. A dangerous insight. So dangerous, in fact, that the man who first made this discovery was executed by his own government. Stalin thought Nikolai Kondratieff was the most dangerous man in the Soviet Union. Why? Because he alone understood how economies really work. The book — really just a pamphlet — was only 23 pages long. You could read it in less than an hour. But it contained an idea so revolutionary. So incendiary. So threatening to the Soviet Union that he was sentenced to ten years of hard labor. But the Soviet bosses didn’t want to take any chances. On September 17, 1938, Nikolai Kondratieff was shot by a firing squad. Because he predicted communism would fail and be replaced by capitalism. It wasn’t an opinion, said Kondratieff, it was a certainty. Because human economies move in waves. When you stop and think about it, that should come as no surprise. Science has taught us, after all, that everything in the universe moves in waves. Sound moves in waves. Light moves in waves. Electromagnetic waves are what let us listen to music on the radio and watch shows on television. Is it any wonder human economies move in the same way? Kondratieff proved that economies act just like waves in the physical world. Like radio waves, they have phases, amplitudes, and frequencies. 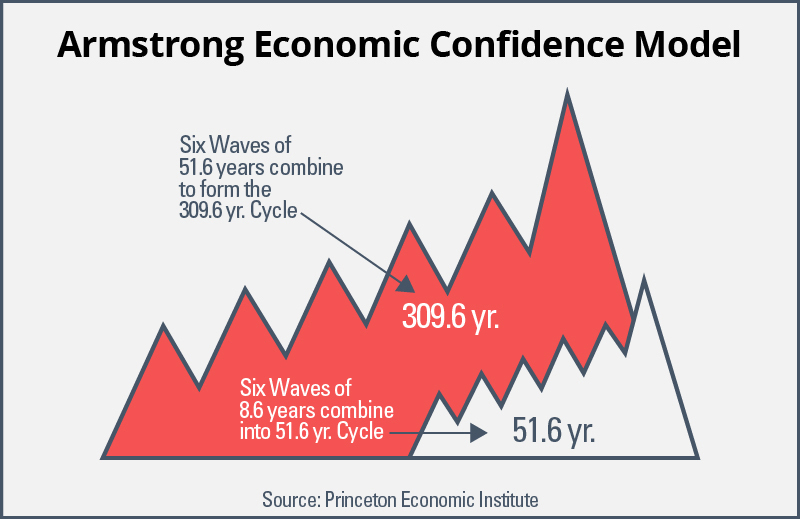 What’s more, economic waves come in cycles that make changes in the economy easy to predict. As easy as the phases of the moon. The rise and fall of the tides. The changing of the seasons. 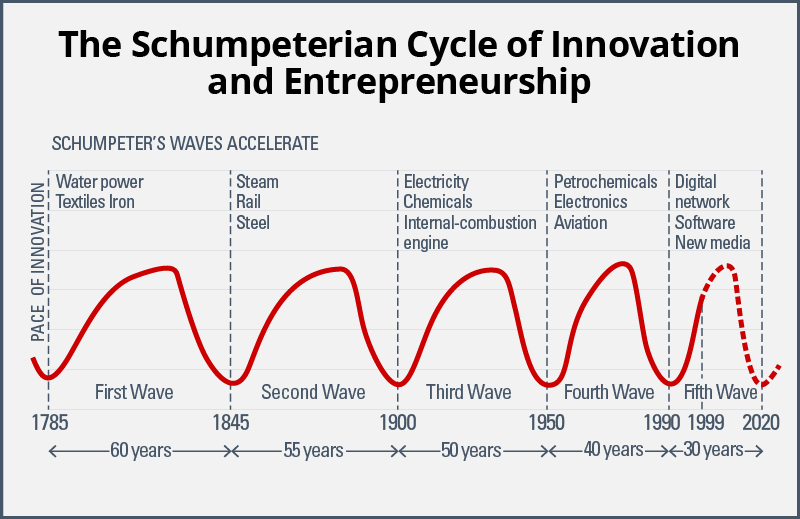 What Kondratieff called “The Long Wave” — which was later named “The K‑Wave” in his honor — shows the changing cycles of private and public influence in the economy. During the private cycle, free enterprise leads to increasing growth and prosperity. Think of the “Roaring Twenties,” for example. Eventually, the wave reaches a crest and begins to collapse in on itself. This collapse is triggered by a stock market crash, a housing bust, or a run on the banks. The K‑Wave crashed with the Great Depression. At this point, the economic wave enters a phase of public influence. The government intervenes in the economy by printing more money. Manipulating interest rates. Increasing government jobs, welfare, and handouts. For a while, everything seems to work fine. But this phase, too, leads to a crash. Because even governments must obey the laws of economics. You Can’t Keep Spending Money You Don’t Have! This is how Kondratieff knew that communism in the Soviet Union would be replaced by capitalism. He predicted it in 1926. Sixty-one years before it happened. 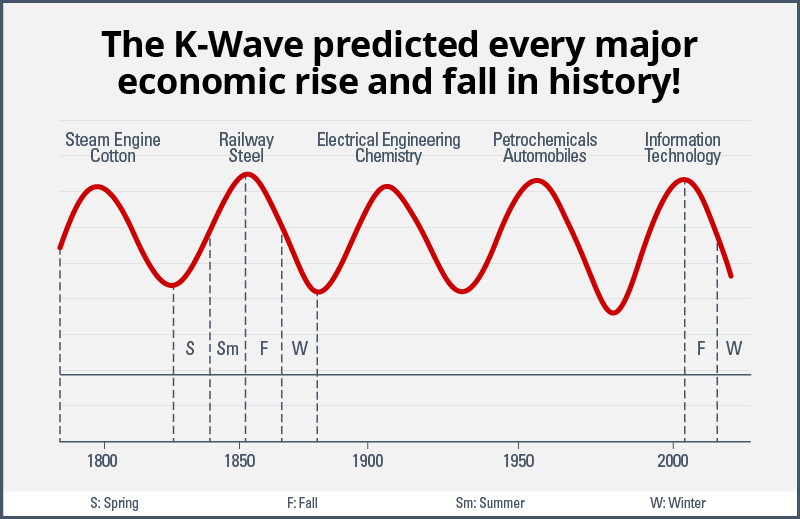 The K‑Wave predicted every major economic rise and fall in history. From crest to crest, you can see the dawn of the industrial revolution. The golden age of railroads and steel. The onset of electrical and chemical engineering. The age of the automobile and oil. And, most recently, the information age which peaked with the rise of Internet stocks in 2000. If the K‑Wave is correct, most economies of the world will soon enter a period of deep recession, even depression. Which could last as long as 23 years and include seismic shifts in the fabric of society. Of course, you could write this off as the hare-brained theory of one mad Russian scientist. But Nikolai Kondratieff was not alone. 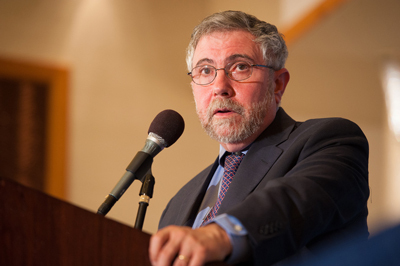 Over the years, other economists have confirmed his theories. They’ve come up with even more accurate ways to predict major shifts in the economy. Predicts "panic bottoms" in the market. Predicts periods of economic and political upheaval. He was recently profiled in The New Yorker magazine. The Model predicts panics every 8.6 years, or 3,141 days. Armstrong’s cycle predicts that a major financial panic takes place every 8.6 years, or 3,141 days. Which you may recall from your high-school geometry is the number that determines the diameter of a circle. If history repeats itself in cycles, you may wonder what was happening 3,141 days ago. We were in the middle of the debt crisis and Great Recession of 2008-2009. What’s really scary is that ALL of these cycles are now pointing in the same direction. If the shorter cycles come into phase with each other — and if they, in turn, join with the K‑Wave — the “amplitude” of the resulting wave would be enormous. It would result in an economic catastrophe of epic proportions. In other words, it would be a TIDAL WAVE of economic change. 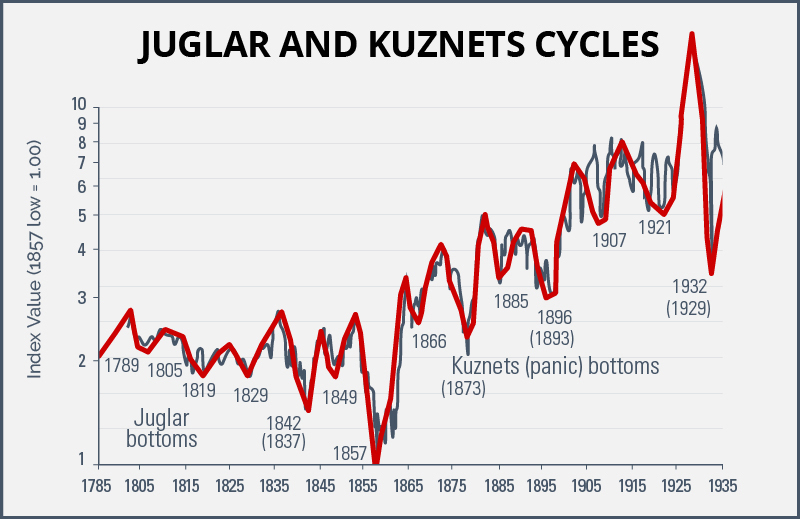 The last time all these cycles converged was during the Great Depression. According to M.I.T. research, tidal waves in the economy work a lot like those in nature. Deep beneath the ocean floor, two tectonic plates rub against each other to create a fissure or fault line. As the pressure builds up over the centuries, a rupture occurs. When two tectonic plates rupture underwater, a tsunami occurs. It’s an earthquake. But it’s happening underwater. So nobody can see it or hear it. Until it’s too late. The earthquake displaces massive amounts of water, which move outward in waves at speeds of up to 500 miles an hour. When the first wave hits the shore, it causes utter devastation. Millions could lose their homes. Millions more could see their lifesavings wiped out in an instant. Businesses, large and small, could close their doors. Even the bare necessities of life — food, water, clothing — might become scarce. This financial devastation will radiate outward from its source at an alarming speed until every civilized human being on the planet is affected. Where Is the “Fault Line” in the Global Economy? So where is the fault line in the global economy? Where is the fissure that threatens to rupture and trigger this economic tsunami? The answer should come as no surprise to you. You see it in the headlines when you open the newspaper every morning. You hear it on TV every night when you turn on the news. It is, after all, where most of the world’s worst human disasters have taken place over the last 2,000 years. Of course, I’m talking about Europe. Ever since the European Union was formed in 1979, the entire continent has been drowning in a sea of debt. Europeans Are Running up a Tab That Soon Will Come Due! For more than 40 years, Europeans have been living like kings and working like couch potatoes. 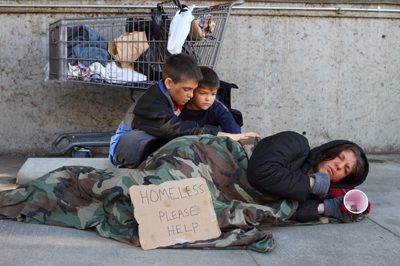 Many Europeans have been living like kings and working like couch potatoes. They’ve been running up a tab that boggles the mind. Despite repeated efforts to bail them out. 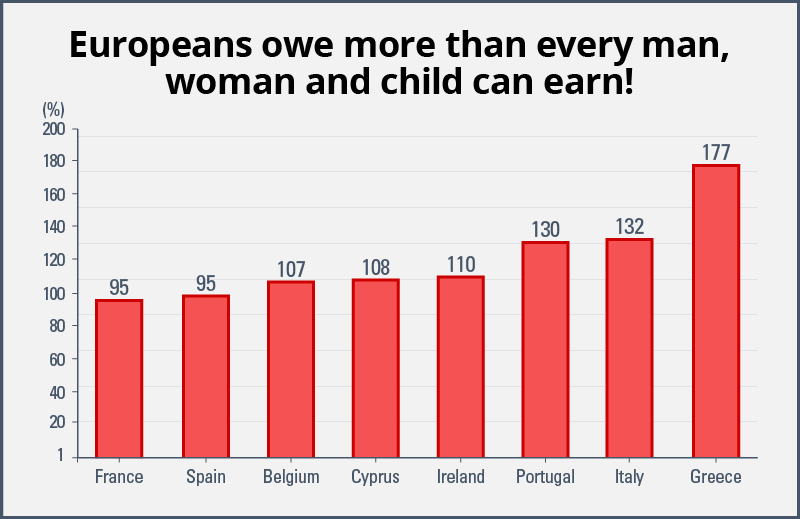 Europeans owe more than every man, woman and child can earn! The people of Spain, for example, would have to fork over ALL of their annual income in taxes just for the government to break even. But many countries actually owe MORE than their people and businesses can produce each year (GDP). Cyprus owes 8% more than its GDP … Portugal owes 30% more … Italy 32% more. Greece still takes the cake with 79% more money in debt than every man, woman and child in Greece can earn. Some “economists” don’t read history. Of course, some economists say it doesn’t matter. They say you can just keep printing more money forever. But history has shown this isn’t true. Ever since Roman emperors began debasing their coins, we’ve known there’s always a price to pay. There’s always a judgment day. For Europe, the judgment day is here. The tectonic plates which have held the EU together for 40 years are starting to show cracks and fissures. Hordes of refugees have amassed in camps at Europe’s border, threatening to climb over the fences. Tens of thousands of young male refugees have broken through to Northern Europe. Unable to speak the language or find jobs, they hang out on street corners, some harassing European women and throwing rocks and bottles at men. 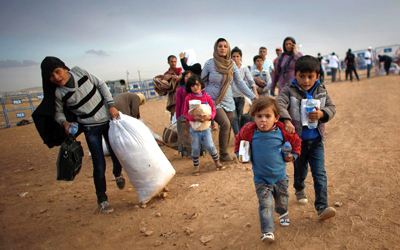 The refugee crisis in Europe is a fuse that could cause the entire continent to explode. And terrorism is also on the rise. In Paris, terrorists killed 130 innocent people and injured 368 more in November of 2015. In March of 2016, terrorists killed another 31 people in Brussels, the capital of the European Union. Then, the attacks became more frequent: Berlin, December 2016. Westminster, March 2017. Stockholm, April 2017. Manchester, May 2017. London, June 2017. Barcelona, August 2017. The majority of British citizens are sick of the EU. Many of their leaders now realize it was a big mistake from the get-go. So they voted to get the heck out. Other nations, such as Hungary and Poland, wish they’d never joined the EU in the first place. Are Hitler and Mussolini Ready for Their Big Comeback? Meanwhile countries like France and Germany have watched the rise of politicians who promise to preserve the purity of their populations. Watching the news out of Europe nowadays is like watching a black-and-white newsreel from the 1930s. 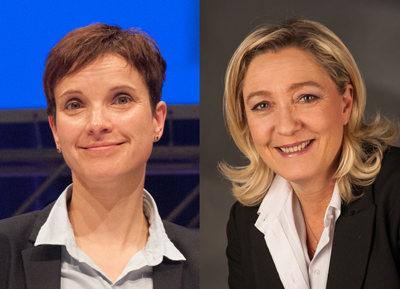 Beware the return of nationalist parties in Europe. No mustaches this time! Like Germany in the 1930s, the highlight of that newsreel could be the collapse of the European currency. Back then, German marks were more useful in the fireplace as kindling than at the grocery store to buy food. Could it happen again? In fact, it’s already happening. And according to the K‑Wave, it’s happening right on schedule. In some European countries, interest rates have now turned negative. Which means you now have to PAY the bank to hold your money. At least the money is safe, you might think. But it’s not. Because governments in Europe are so broke they can’t keep their greedy hands off it. And took 40% of it! They didn’t even have the courtesy to leave a thank-you note. It’s called a “bail-in.” Because European governments no longer have enough money to bail banks out. Watch Out for the Collapse of the Euro! Meanwhile, the euro continues to drop in value. At its peak in 2007, one euro was worth $1.59. As of October of 2017, it was worth just $1.17. That’s a drop of 26%. When it becomes worth less than a dollar, the euro could go into free fall. The EU will break apart. And when it does, the euro will collapse. This is the “economic earthquake” that will send shockwaves throughout the global economy. And the first place the tsunami will hit is Japan. Because after the United States and China, Europe is Japan’s biggest trading partner. When Japan sends cars, cameras, and computers to Europe, they expect to get paid for them. If they don’t get paid — or if they get paid in devalued euros — the fault lines in Japan’s own economy will crack wide open. Because even though Japan seems like a rich country, it’s economy is actually a house of cards waiting to fall down. First, because the national debt in Japan is even WORSE than any country in Europe, including Greece. Japan has the biggest government debt pile-up in the world — more than one quadrillion yen. 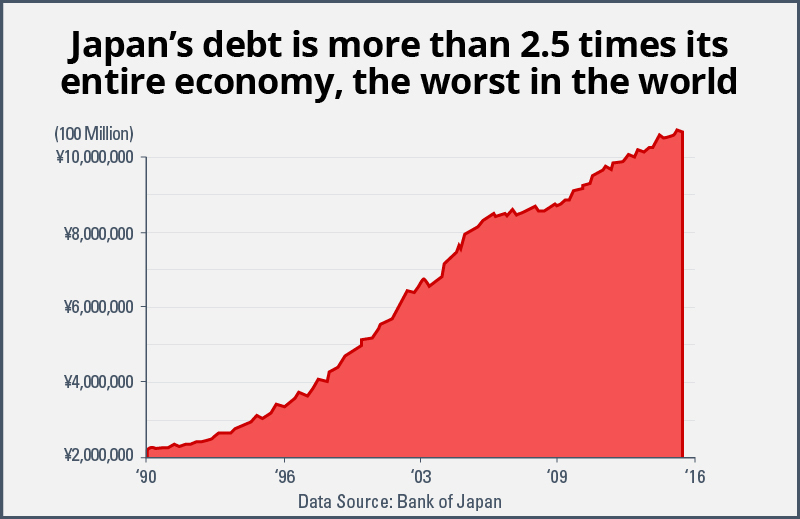 Japan’s debt is more than 2.5 times its entire economy, the worst in the world. That’s more than two and a half times the entire Japanese economy. Which makes the Greeks look downright frugal by comparison. What’s more, the Japanese keep adding to their debt at a rate of 97 trillion yen per year. So why haven’t you seen riots in the streets of Tokyo like you did in Athens? Because the Japanese still have a strong manufacturing base and a healthy trade balance. As long as Europe keeps buying Hondas and Sony’s, the Japanese can keep their Ponzi scheme going. When the euro falls, however, it will take the yen with it. And the Japanese economy — the third largest in the world — will come tumbling down. Japan’s Worst Problem — Deflation! But the deficit isn’t the worst of Japan’s problems. The bigger problem is that the Japanese people aren’t stupid. They know their debt is not sustainable. They know their pension plans and social security checks are at risk. So they’ve been hording money at an alarming rate and refusing to spend it. As a result, many consumer prices dropped like a rock. When the Japanese consumer knows the price of a car will be LOWER next year than it is today, what does he do? He saves his money and waits until next year, of course. The typical Japanese consumer would rather save his money than spend it. And who can blame him? This kind of deflationary cycle is what can turn a recession into a depression. The Japanese have suffered four recessions in a row since 2008. For all intents and purposes, Japan has been in a depression for many years. Which makes it even LESS likely they’ll ever be able to get out of debt. Just like the walls of traditional homes, the Japanese economy is made out of paper. When the K‑Wave hits Tokyo, the result will be devastation. Welcome to the Only Country in Worse Shape Than Japan! But there’s one country in the world that’s in even worse shape than Japan. Even worse than the European Union. Even worse than Greece. The United States will be the last place the tsunami hits. But because it’s the world’s biggest economy, it will suffer the most. America also has the world’s worst debt, although politicians don’t like to talk about it. They’ll tell you it’s “only” 20 trillion dollars. Suddenly our debt looks more like 127 trillion dollars. Which would make it worse than Greece. Worse than Japan. Worse than any other country in the world. Every Baby Born Owes Uncle Sam $1,100,000! And a bill from Uncle Sam for 1.1 million dollars. Again, some economists say this is nothing to worry about. We’ve been running a deficit ever since the Revolutionary War, they say, and we’re still here. It’s no different than carrying a long mortgage. Here’s what happens when you can’t pay your debts. But when you can’t afford to make payments on your mortgage, that’s when they kick you out on the street. Which is exactly what will happen to the United States in a few short years. Before long, payments on the national debt will become the third largest item in the federal budget. What can the Fed do to get us out of this mess? They’ve only got three big guns in their arsenal, and they’ve already fired all three of them with no impact. They tried lowering interest rates. Since 2007, the Fed Funds rate has dropped from 5.5% to just 0.26%. That’s a 95% reduction, but it didn’t help. Big gun number one? Dud! They tried pumping cash into the banking system in exchange for bonds and securities. But in 2007, the Fed’s balance sheet was just $890 billion. Now it’s $4.5 trillion and they’ve got nothing to show for it but a pile of their own lousy bonds. Big gun number two? Misfire! Finally, they tried to stimulate inflation. But recently, the CPI grew by only 0.7% and producer prices actually fell by one percent — ushering in a new era of deflation. That’s something we haven’t seen in the United States since … you guessed it, the 1930s. 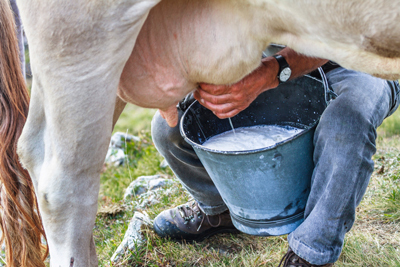 Speaking of deflation, I was on an airplane not long ago and I sat next to a dairy farmer. He said milk prices have fallen so low he’s now milking his cows three times a day just to break even. It’s a classic deflationary spiral — the first sign of a coming depression. Big gun number three? BACKFIRE! And don’t think for a moment they won’t use them. The crisis will start in the global bond markets as investors start dumping U.S. Treasury bonds at any price. Washington will respond by raising interest rates. But no matter how high the rates go, investors will avoid U.S. bonds like a five-day-old fish. As interest rates rise, America’s retirees will watch the bond prices in their portfolios take a nosedive. The value of investments that millions of retirees depend on for income — including private pensions and “guaranteed” annuities — will vanish. With no reserves on hand and nobody left to lend it money, the government will have no choice but to start laying off its 2.7 million federal employees. Next they’ll delay sending out Social Security checks. No more money for Medicare and Medicaid. No more food stamps. Welfare checks. Or disability payments for veterans. Banks and businesses will shut their doors. No food on the grocery shelves. That’s when the American people will take to the streets. Some in peaceful protest, yes. But millions more will take to the streets in hunger, anger and fear. When this happens, don’t count on the government to help you! You can dial 911 if you want, but you’ll just get a busy signal. Because the police, the National Guard and the army will be patrolling the streets in tanks warning people to stay inside or risk getting shot. The government will not be your friend at this point. The government will NOT be your friend at this point. It will be your mortal enemy. Because there’s nothing more dangerous than a government fighting for its own survival. Like a wounded animal, it will do whatever it can to stay in power. Even if it means taking away your freedom and stealing your money. Time to Pack Your “Bug-Out Bag” and Run? Or Would You Rather Get Rich? You know what? It’s not such a bad idea! But it’s not for everyone. I’ve got a better way to protect myself. And you do, too. The answer is to get rich. Rich enough to weather the storm and keep your assets out of danger. The best defense, in other words, is a good offense. And guess what? The K‑Wave itself will give you the perfect way to do that. 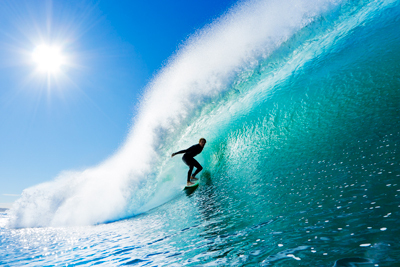 Here’s How to Surf the “K‑Wave” Safely to Shore! By “surfing” the K‑Wave safely into shore. Because after Europe and Japan collapse, the K‑Wave will reach a “crest” before it hits the United States. Like any wave, the K‑Wave will reach a crest before it crashes. You see, investment capital always flows in one direction: It flows AWAY from danger and TOWARDS safety and growth. As Europe and Japan collapse, rich people in those countries will look for somewhere to put their money where it will be safe and have a chance to grow. What Would You Do if You Were in “Pierre’s” Shoes? Suppose, for example, your name is Pierre Dubois and you live in Paris. 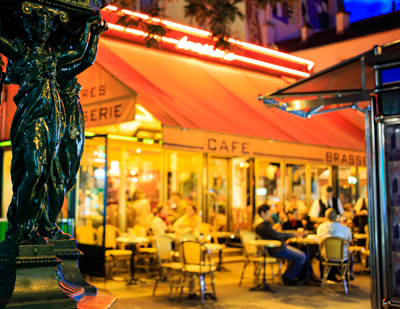 For 30 years you’ve owned a restaurant on the Left Bank and now you have 500,000 euros socked away for your retirement. But the French government has been talking about negative interest rates to stimulate their failing economy. Which means that for every year you keep your money “safely” in the bank at negative 0.05%, you’ll lose 2,500 euros! You’ve thought about smuggling the cash out of the country. But the French police now have “cash-sniffing” dogs at the borders to stop you from doing that. 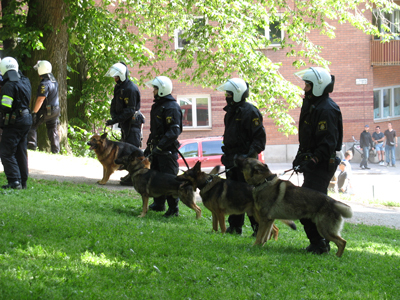 These dogs don’t sniff out drugs, they sniff out cash! What you really need is someplace to invest your money. Someplace safe and secure. Someplace where it will grow enough to offset your high French taxes. Let’s go back to the last time the K‑Wave hit the global economy with the kind of force that’s now on its way. 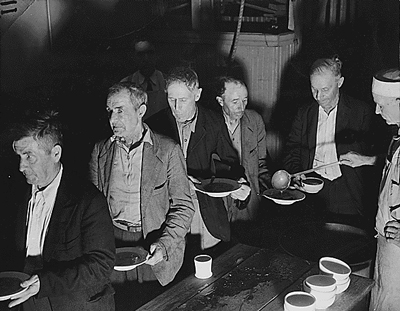 I’m talking about 1932 — the depth of the Great Depression. This is the great untold story of the Depression in America, the part that’s never taught in schools. Everybody knows about the crash of 1929 and the Great Depression. Investors jumping out of the windows on Wall Street. The soup lines. The Dust Bowl. But nobody remembers the period between 1932 and 1937 was one of the greatest bull markets in history. During this time the Dow Jones Industrial Average rose by 372%! During the depths of the Depression, the Dow rose 372%! Enough to turn $10,000 into $47,200 in five years! That’s enough to turn $10,000 into $47,200 in just five years. That’s the same as $780,543 today. What caused this incredible run-up on Wall Street? Why were some people getting rich inside the New York Stock Exchange when so many people outside were standing in line for soup? Because in 1932, Europe was in even worse shape than the United States. Germany was bankrupt. France, Italy, and even England were facing dire financial problems of their own. Yet there were still lots of rich people in Europe. Many of them sitting on family fortunes dating back hundreds of years. 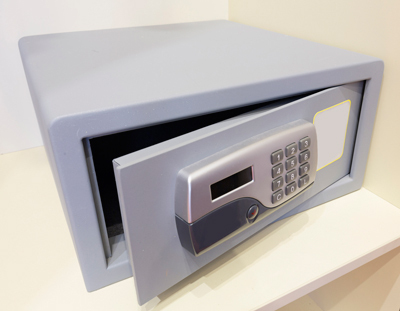 They needed to find a place to stash their money where it would be safe, secure, and have a chance to grow. They found it in the American stock market. Because America was still a lender nation back then, not a borrower. The U.S. Dollar was still backed by gold. Our great blue-chip companies like General Motors and General Electric were strong. The American stock market, in other words, was the safest place in the world to sock away some money. Wall Street looked like the land of milk and honey. So the Dow Jones soared. And some people got crazy rich as a result. Take J. Paul Getty, for example. He became a billionaire at the height of the Great Depression. How? It triggers a TIDAL WAVE OF CAPITAL flowing out of government bonds and into stocks. The Dow Jones rallied from a low of 40.52 in July of 1932 to a high of 195.2 in March of 1937. That’s a gain of 372% during the worst depression in history! By the time J. Paul Getty died, he was worth $19.6 billion in today’s dollars. 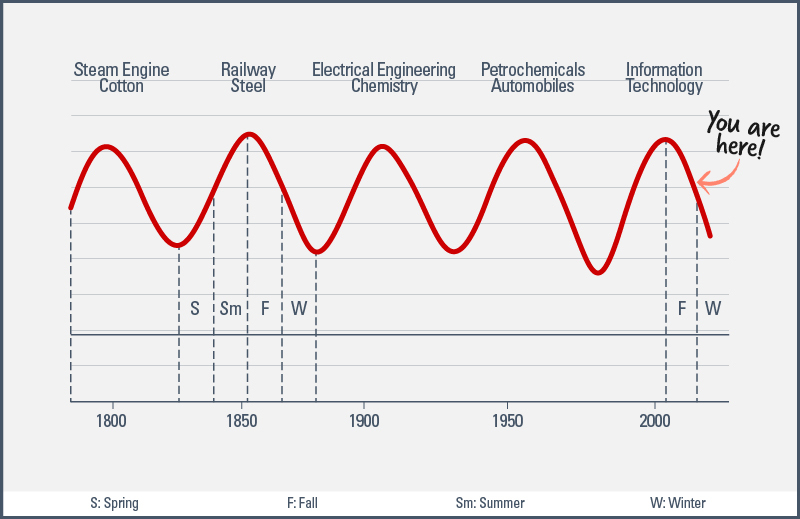 Flash forward 85 years — or two K‑Wave cycles — and you’re watching the same thing happen again. The K‑Wave tsunami will wipe out the European Union. Then the tidal wave will crash into Japan within a year. At that point, millions of wealthy Europeans and Japanese will be searching the globe for someplace safe to stash their money. The so-called BRIC countries — Brazil, Russia, India and China — offer a chance of growth … but no safety or security. Would you trust your lifesavings to Vladimir Putin or the dictators in Beijing? In Brazil, the president was recently impeached as millions took to the streets, and the new president is even more corrupt. In India, over 190 million people are still starving. It certainly won’t go into U.S. Treasury bonds because there’s no return there. And with $127 trillion dollars in debt, there isn’t much safety either. Some of it will go into gold, of course. But there isn’t enough gold in the world to accept this massive influx of money. High-rise condos like these in New York are the “bolt-holes” of rich Europeans and Asians. Some of it will go into high-end American real estate. In fact, you’ve already seen that happen. 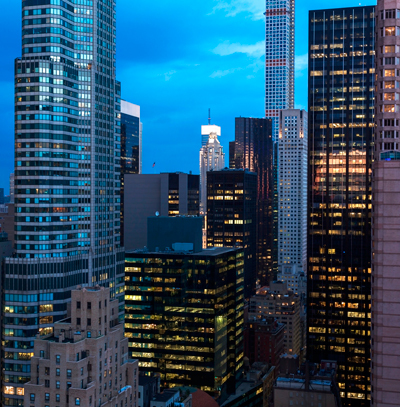 You’ve probably read about the skyscrapers in New York filled with $100 million condos. These apartments are the “bolt holes” of frightened Europeans, Japanese, and other Asian billionaires. But the problem with owning a luxury condo is that it isn’t liquid. If you need to get your $100 million out of your condo fast, how quickly can you sell it? Catch the Crest and Escape the Crash! That’s why the K‑Wave will reach a “crest” in the stock market before it hits the American economy. As the K‑Wave crests, I predict the Dow Jones will reach at least 45,000 by 2020. How did I come up with such a shocking figure? Our artificial intelligence software—the “E-Wave Model”—did the calculations. But they’re not hard to understand. 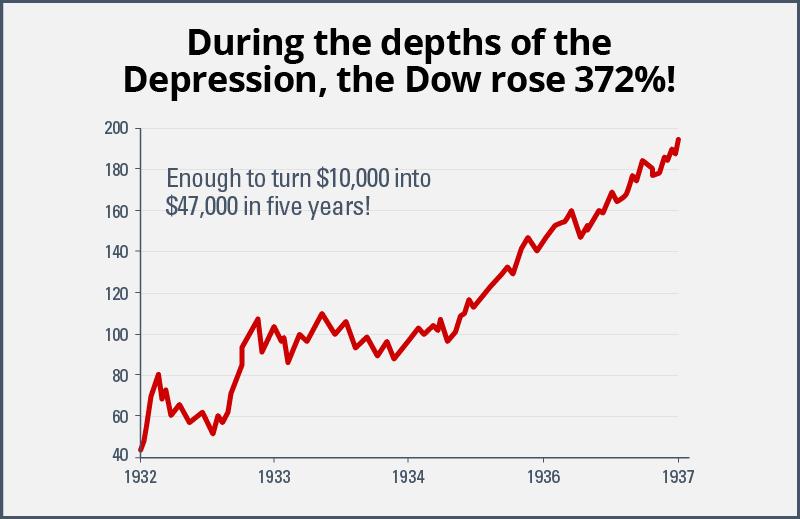 The model took a key point of the Dow and multiplied it by the same amount the Dow rose during the Depression. But I said “at least” 45,000 because I believe that’s a conservative estimate. According to our model, the Dow could go much, much higher. Multinational Corporations Have Cash to Protect, Too! Because we’re not just talking about individual European and Japanese investors here. We’re also talking about multinational corporations, both foreign and domestic. Apple alone has more than $260 billion on its books right now, most of it parked in low-yielding investments overseas. That’s more cash than most major governments keep on hand! As those investments get more and more risky — and yield less and less income — the bean counters at Apple will be looking for somewhere else to put it. And the first place they’ll look will be Wall Street. Johnson & Johnson … General Electric … Pfizer … and dozens of others are in the same cash-rich quandary. Where can you put your savings that is safe, liquid, and has some chance of growth? You Are in for the Greatest Bull Market Ride in History! Which is why you and I are in for the greatest bull market ride in history. If you’re over the age of 50, this is likely to be the last great bull market of your lifetime. Even if you’re the under the age of 50, it could be the fastest run-up in stocks you’ll see as long as you live. Because you’ve read this letter, you will be one of the few people who understands what’s going on! YOU will know exactly what’s happening and why. Will you take advantage of it? Or will you be popping the cork on a bottle of champagne and telling the skipper of your yacht to set sail for your private island in the Caribbean? But you’ve got to make that choice today. Because the window of opportunity is small and it will slam shut before you know it. Where Will YOU Be When the K‑Wave Crashes? Or one of the millions who are hungry, desperate, and afraid. In other words, you might be tempted to sit tight and do nothing. But sitting tight is the worst thing you could do. First, because you can't expect EVERY part of your portfolio to rise in lockstep with the Dow. If you have a diversified portfolio — as most investors do — the K-Wave will cause many of your stocks and bonds to crash even while the Dow is going up. Second, you can do more than just double your portfolio in order to protect yourself. That’s why I’m going to tell you in the next few minutes how you could make 300% … 400% … even 500% on your investments in a short amount of time. Because you’re going need that kind of growth to stay safe after the crash. The Tide Will Go OUT Before It Comes Back In! The third reason you can’t sit tight is because the K‑Wave will act just like a real tsunami. In other words, the tide will go out just before the wave comes in — like a powerful undertow. Our “E-Wave Model” says the Dow could suffer a severe correction before it starts to rise again. But in the next few minutes, I’ll tell you how to protect yourself from this undertow and position your portfolio for the crest that’s right behind it. That’s why sitting tight is the worst thing you can do. Let me tell you what I’m doing to grow my own portfolio and protect my family from what’s ahead. I’d like to send it to you for free when you click the button below. In it, you’ll find Five Steps you can take NOW to “surf” the crest of the K‑Wave safely to shore … and protect yourself from the crash that will follow. STEP #1 is to get out of your most vulnerable investments immediately. If I told you, for example, that a real tidal wave was headed your way in the next few weeks, wouldn’t you sell your beach house now? At the very least, wouldn’t you remove any valuables and furniture that weren’t nailed down? Well, that’s exactly what I want you to do with your portfolio. I’m talking about such things as Treasury bonds, muni bonds, high-yield corporate paper, and companies with too much exposure to Europe and Japan. In your FREE REPORT, I'll tell you exactly which investments you should sell for cash now. STEP #2 is to buy the safest blue-chip stocks we recommend when the undertow puts them on sale. As I said a moment ago, there’s going to be a powerful undertow before the K‑Wave hits Wall Street. 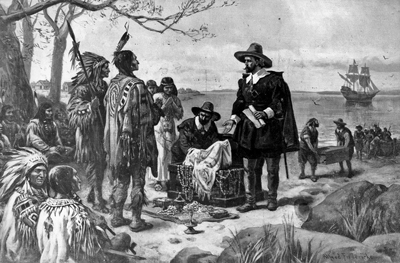 The good news is that when the tide is low, you’ll be able to pick up some great American stocks at bargain prices. In your FREE REPORT, I will tell you which blue chips to sell as the K‑Wave crest begins to form. Plus, I’ll give you sneak peek at our “E-Wave Model,” the artificial intelligence software we use to help you time those moves to perfection. Because if you “surf” the K‑Wave perfectly, you should be able to do more than just double your money. 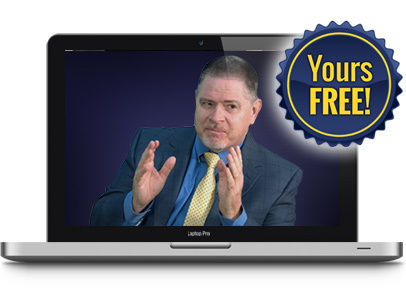 You should be perfectly positioned to multiply your money by 300% … 400% … even 500%. When the K‑Wave crashes into the American economy, you’re going to need that kind of money to keep your family safe and secure. STEP #3 is to take advantage of a stronger U.S. Dollar as the euro and yen collapse. Starting very soon, you’re going to see chaos in the global currency markets unlike ever before in history. The euro will collapse. It will drag the yen down with it. Other currencies around the world will fluctuate like crazy. But the good old American greenback will keep getting stronger as the world stashes their cash in dollars. You don’t have to be a currency speculator to make money on this. In fact, you don’t have to play the currency markets at all. 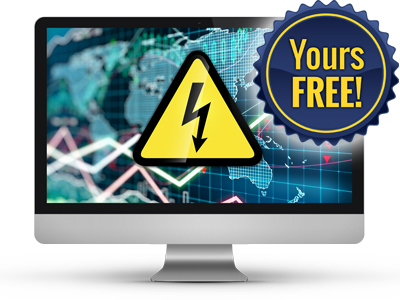 In your FREE REPORT, I will show you some easy ways to take advantage of a stronger dollar. Retailers who specialize in imports, for example will see their profits soar. American manufacturers who buy raw materials overseas will enjoy profits they haven’t seen in years. Domestic homebuilders will benefit from cheaper lumber and copper. And in your FREE REPORT I will steer you away from those, too. STEP #4 is to get ready for World War III. When the EU collapses, the national borders will go up again. The finger pointing will start. The fascist political parties will take power. When the Japanese economy collapses, meanwhile, don’t expect China to send them a sympathy card. Those two countries have hated each other for centuries. With the Japanese economy in the tank, China will start gobbling up the land both countries claim to own. America will be dragged into these conflicts in one way or another. Our military alliances with Europe and Japan are so strong it will be impossible to stay out of it. Which is why defense and security stocks will be among those to rise most during the K‑Wave. 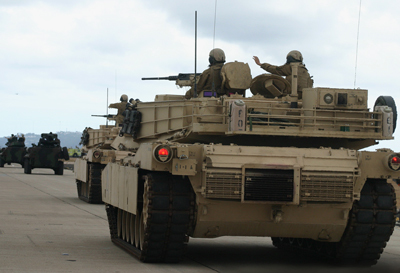 In your FREE REPORT, I will give you the names of my top three U.S. Defense stocks. Including the Fortune 500 company that is the ONLY firm that builds and maintains nuclear-powered ships for the U.S. Navy. This is a stock that could easily turn every $10,000 you invest into $30,000 when the you-know-what hits the fan. STEP #5 is to wait until gold goes on sale, then back up the truck! When the K‑Wave crashes into America, the most valuable asset in the world to own will be gold. BUT MAKE NO MOVE ON GOLD UNTIL YOU HEAR IT FROM ME! In your FREE REPORT, I will give you the exact date, time, and price when gold has been cleared for takeoff. That’s when you should back up the truck and buy as much of the yellow metal as you can get your hands on. Because our “E-Wave Model” is telling me gold could shoot up to $5,000 an ounce when the K‑Wave comes to America. I’ll also tell you how to own your gold. Because some gold investments will be safer and more profitable than others. Some will be downright dangerous. Owning shares in mining companies, for example, is a great way to leverage the rising price of gold. A 25% rise in the price of gold could result in a 300% rise in profits for a gold mining company. The company’s share prices could shoot up even higher. The last time the price of gold surged, for example, some mining stocks generated returns of up to 3,000%. That’s enough to turn $10,000 into $300,000! So if the price of gold goes to $5,000, sitting on a pile of mining stocks could make you look like King Midas. And they’ve been going through a rough patch recently. Some of them aren’t going to be around when the big run-up takes place. And I don’t want you holding the bag if some of the biggest names in the business go belly up. 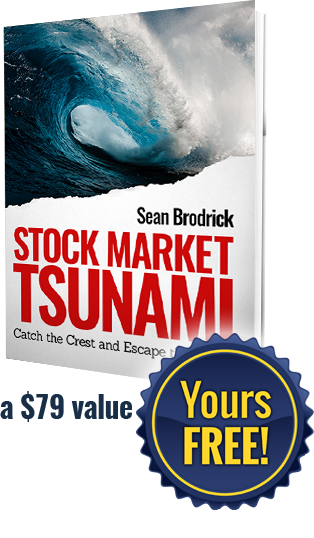 That’s why it’s so important that you get your free copy of “STOCK MARKET TSUNAMI” right away. When you click the button below, I’ll send you a copy of this privately-circulated report absolutely free. You can be reading it in a matter of minutes from now. What’s more, I’ll also invite you to accept a risk-free subscription to my monthly bulletin Wealth Supercycle. You see, your book and monthly bulletin go hand in hand. Because the K‑Wave is a moving target. 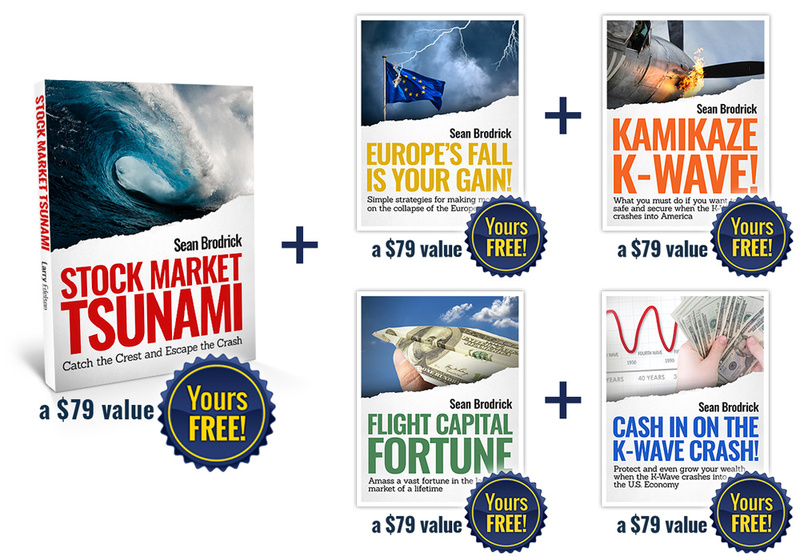 In your free copy of “STOCK MARKET TSUNAMI”, I’ll lay out the basics for you. We’ll explain exactly what’s going to happen and why. We’ll give you the five steps you must take now to profit from the crest of the wave and protect your profits from the crash. I need to be in constant touch with you to make sure you take full advantage (and every precaution) as these seismic shifts take place. The only way I can help you do that is with the monthly bulletin, Wealth Supercycle. You’ll get “Flash Alerts” when you need to take action quickly. Private online briefings every 90 days. I’ll also send “Flash Alerts” to your inbox when there’s a change in the market that calls for action on your part. When I meet with members to answer your questions and give you my forecasts for the coming quarter. Plus, as a member of my inner circle, you’ll receive my Wealth Wave e-letter every Monday, Wednesday, and Friday. 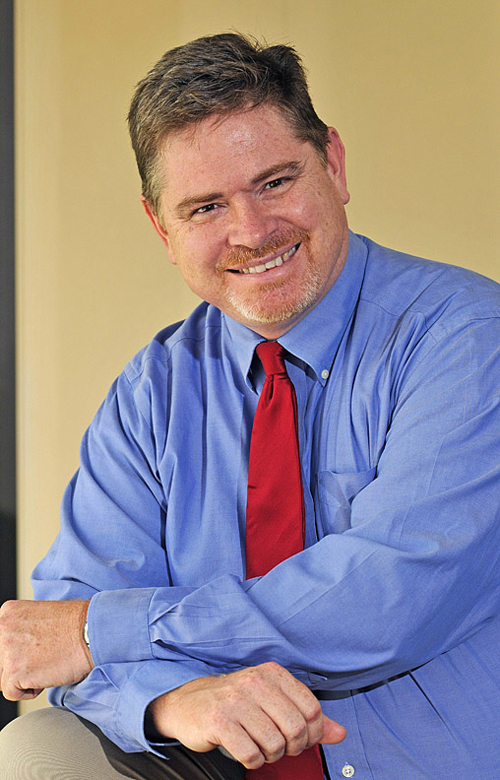 My team and I will provide our latest insights on the stock market, gold, energy, real estate and more. You’ll also get updates on my cycle forecasts and the impact on world events and your investments. 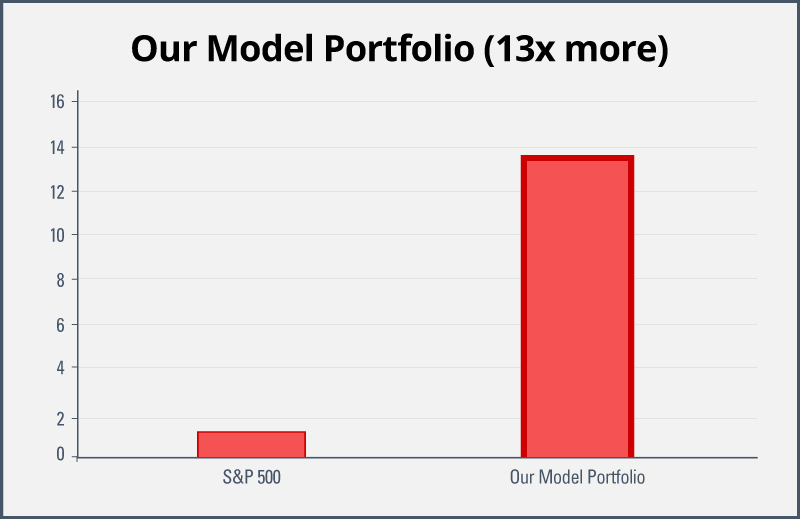 Model portfolio makes it easy to make the right moves. Each issue of Wealth Supercycle contains a “model portfolio” that shows you exactly what to buy, what to hold, what to sell … and when. Up in the “Lousy” Year of 2015! Beat the average hedge fund by 41 times over! And, of course, with the benefit of the bull market of 2016 and 2017, which we accurately predicted back in 2015, subscribers following our recommendations are making money hand over fist. No wonder our members would gladly pay $228 a year for this service. In fact, some of them have told us they would pay ten times as much for their subscription. But you won’t pay even half as much. Not even one quarter of it! I’ll also give you a one-year, risk-free-trial subscription to Wealth Supercycle for just $29. That’s about 8 cents per day. Heck, you’ve probably got that much stuck in the cracks of your couch! Because I’m on a mission to save as many people as I can from the coming K‑Wave tsunami. I’m Tossing You a Lifeline! Do you know where the safest place to be when a tidal wave hits the shore? Well, the safest place is to be is on a mountaintop a thousand miles inland! But believe it or not, the next safest place is to be on a boat. If you’re on a boat in deep water, the tsunami will pass harmlessly underneath you. All you’ll feel is the boat go up as the wave goes by. That’s exactly how I look at Wealth Supercycle. But it will help you ride the crest to a level of wealth you never dreamed possible. And motivated enough to protect themselves. Try It for 12 Months Without Risking a Penny! I’ll think you’ll want to stick with Wealth Supercycle for as long as it takes for us to get through this crisis. First, I’ll give you a 100% money-back guarantee for 12 full months. You’ll get ALL of your money back, even if you ask for a full refund on the last day of your subscription. No questions asked. Second, I’d like to send you THREE MORE SPECIAL REPORTS to help you take advantage of every phase of the coming K‑Wave. Like Lining Up Three “7’s” on the Slot Machine! FIRST, you’ll hit a jackpot when the European Union cracks apart. And you can do it without shorting stocks or playing the currency markets. 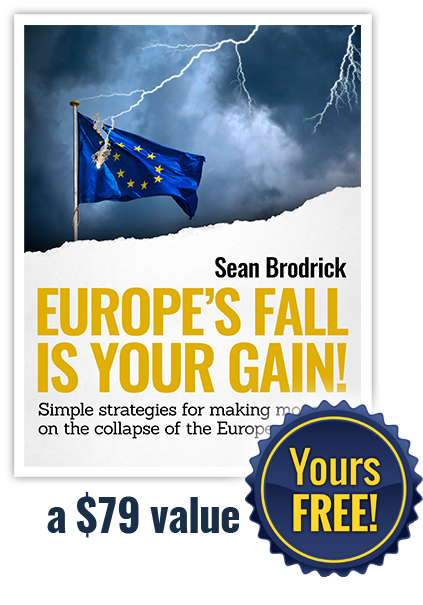 In your free report, “EUROPE’S FALL IS YOUR GAIN,” you’ll get some simple strategies for making money on the collapse of the European Union. If the stock markets in Europe plunge 60%, for example, we’ll show you an inverse ETF that could turn every $10,000 you invest into $28,000. SECOND, you could score another jackpot when the K‑Wave strikes Japan. Again, there’s no need for going short, buying options, or using any complex hedging strategies. 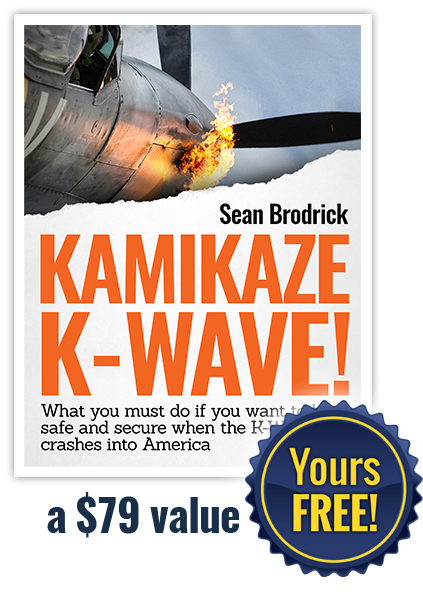 Your free report, “KAMIKAZE K‑Wave,” will give you the names of several blue-chip American companies that could take off when Tokyo tanks. THIRD, you could hit another jackpot when the K‑Wave starts to crest in America. As I said before, our “E-Wave Model” predicts the Dow will hit 45,000 by 2020. But you can — and you must — do better than that if you want to be safe and secure when the K‑Wave crashes into America. 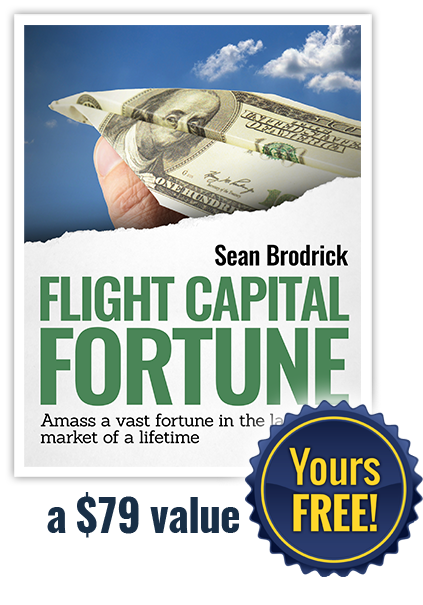 So in your free report: “FLIGHT CAPITAL FORTUNE!”, you’ll find out how to amass a vast fortune in the last bull market of your lifetime. Finally, let me send you one more bonus gift to thank you for giving Wealth Supercycle a risk-free try. 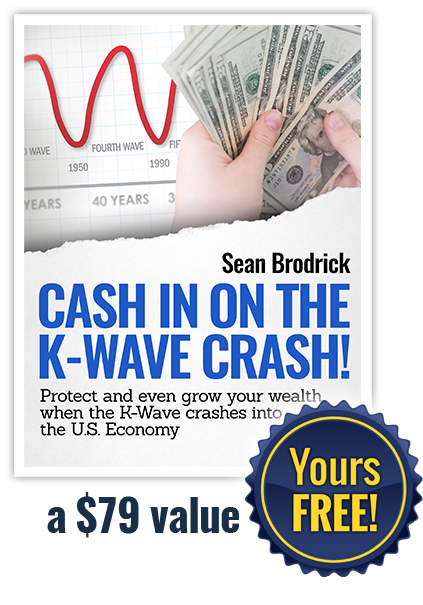 “CASH IN ON THE K-WAVE CRASH” will show you how to protect — and even grow — your wealth when the K‑Wave finally crashes into the U.S. economy. How to take full advantage of a precious metals market that could send the price of gold as high as $5,000 an ounce. And how to buy the hard assets, inverse ETF’s, and rock-solid stocks that will prosper in the bloody aftermath of the K‑Wave crash. CLICK HERE FOR YOUR FIVE FREE REPORTS NOW! But, time is running out on your chance to get rich in the K‑Wave before it wipes out nearly everything you own. You’ll be sent to an order page where you can take as long as you need to decide if Wealth Supercycle is for you. Including my “Flash Alerts,” model portfolio, and our regular e-mail updates in my free e-zine, Wealth Wave. That’s a total of $623 worth of newsletters and special reports for just $29. Your satisfaction is guaranteed until the clock strikes midnight on the last day of your subscription. You’ll keep everything I’ve sent you and get ALL YOUR MONEY BACK with no questions asked. Let me end on a hopeful note. I believe America will survive this K‑Wave crisis. In fact, I believe we will come out on the other side stronger than ever. Our economy is about to go on a roller coaster ride through hell. All the normal “rules” about how to invest and how the economy is supposed to work will be turned upside down in the chaos of the crash. The aftermath of the K‑Wave — like the aftermath of a tidal wave — will be ugly and brutal. Many will be wiped out. Many will lose their homes. Many will see their financial lives ruined forever. But I don’t intend to be one of them. And I don’t want you to be one of them either. I want us to be among the fortunate few who come out stronger and wealthier than ever. That’s why I urge you to click the button below and join me as we ride the crest of the K‑Wave to riches!